Beautiful Surrounding Views, 1 Mile From Main Business District, Absolutely Stunning! Truly Amazing Single-Level Estate Home. Prime rural location within Kingman city limits, this unique, “one of a kind” single family, ranch style home is an exceptional home for family and can also be used for business purposes while being used as a residence with ample parking and convenient location. The setting is peaceful and serene with gorgeous panoramic views in almost every direction including the Hualapai Mountains, Peacock Mountains and Cerbat Foothills plus other beautiful formations. There are also views of a portion of the city and county. This estate has a wonderful family atmosphere, excellent weather, stunning sunrises, and gorgeous Arizona sunsets. This is the perfect horse property where you can saddle up for unbeatable horseback riding, right from your property. And there are more local horse trails within 5 miles that will warm your heart with romance of the Old Southwest! The tranquility will permit you to enjoy a special life of luxury in this rural setting which is about 1 mile to the primary uptown business district with its shopping, restaurants and services. It is also 1 mile to the Kingman Regional Hospital and a wide variety of other medical offices. The Kingman Medical Center, Del Webb Wellness Center is also on the same complex as the hospital with exercise equipment, an indoor heated pool and other amenities. Rural Residential zoning (City of Kingman, Mohave County, AZ; ) allows horses and multiple other uses, with no HOA. There is much room for the largest of RV's and horse trailers. This home with its rural residential zoning can also be used for business purposes while being used as a residence. The home was built in 1964. It is a single level interior except the loft off the family room and an attic door entry off loft. The property is lovingly landscaped with gravel, flagstone and grass with a mix of trees, shrubs, flowers and desert areas. Auto timer H2O is installed for all landscaping. There is no pool but there is room for one if desired. Technology includes Cat 6 hardwired for network; good service by antenna TV including ABC, NBC and CBS networks; also, Dish TV, Cable TV, and Satellite are available. There is a sound system through most of the home and to the barbeque courtyard, generating from the family room, and with individual controls in each area where there are speakers. This is a “one of a kind” home with exceptional construction including block with elastomeric paint, 2x8 fascia with covered eves, 2x8 rafters or 4x6 beams and other features which cause it to be considerably better constructed than the typical residence. An oversized septic system of approximately 5,000 gallons that is constructed of block saves on sewer and water charges. There is also grey water system. Windows are a mix of dual pane and single pane. Roofing is shingles, cooling is 3 ground set electric refrigeration units. Heating is 3 higher efficiency natural gas furnaces. All 3 water heaters are higher efficiency natural gas. The floor coverings are a mixture of wood laminates, carpet, tile and flagstone to blend in with the ambiance of the areas in which they are located. Ample onsite convenient parking is available to host small to larger gatherings on the 4.91 acres, all of which is fenced except at the front entry. There is a wonderful family atmosphere, with excellent weather, stunning sunrises, and gorgeous Arizona sunsets. 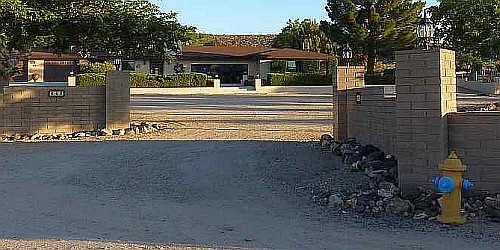 Many who have been in this home have said that “there is no other home like it, in Mohave County”. Live In Elegance In Northwest Arizona! The information contained herein has been obtained through sources deemed reliable by the seller and the website designer but cannot be guaranteed for its accuracy. We recommend to the buyer that any information, which is of special interest, should be obtained through independent verification. ALL MEASUREMENTS ARE APPROXIMATE. A home inspection to protect yourself is strongly recomended.